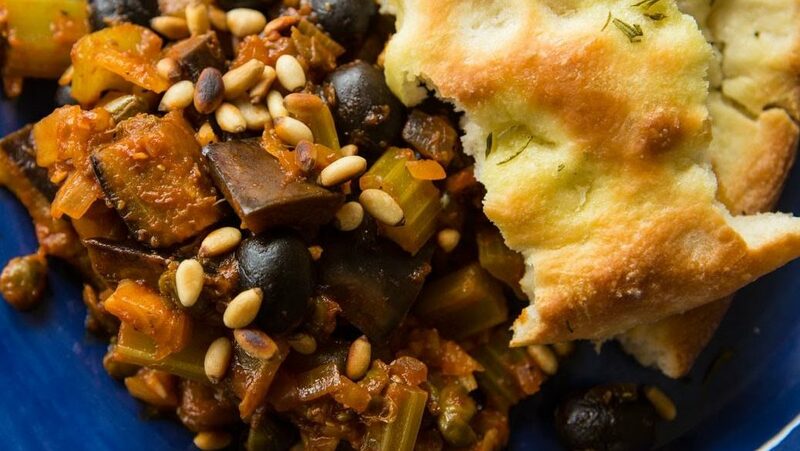 Caponata is a Sicilian Vegetable Stew based on vegetables, above all aubergines. Serve it with our delicious rosemary focaccia bread. BLANCH the chopped celery in lightly salted water for a few minutes, then drain. by the oil. – you may need to add another spoon of oil. WHEN the aubergines are golden on each side remove from the pan and drain on some kitchen paper. INTO the same used pan put a little oil and add your blanched celery, onion, and crushed garlic. FRY for a few minutes and then add the tomato paste, vinegar, sugar, olives, capers and water. REDUCE the heat to low and cook covered for 10 mins.